It is still so surprising to see how quickly time passes here in Haiti. The frequent flow of teams coming and going from the Work and Witness Guest House plus our 3 months of Deputation in Canada and US has made it so 2015 a year that flew by quickly. As we begin to settle into 2016 we are praising God for continuing to turn hearts towards His Son and also towards Haiti. The growth in the Church of the Nazarene in Haiti is staggering. We are told that we need 1000 new church buildings as of yesterday by key Regional leadership in order to just catch up on the past needs of the Church in Haiti. Just this last year we had another approximate 1000 new preaching points started which all need Patio Churches. In response to trying to keep up with the Lord in what he is doing we have started to build the Chapel Factory and hope to have it completed in just a few months. When this Factory is completed we hope to hire more Haitians to oversee it and begin to build 100’s of new structures for these new baby congregations. We are grateful to God for what He is doing in bringing souls to His Son and for the opportunity to partner with local congregations in helping them, help themselves in building buildings in which to gather together in His Name. We are also thankful for the teams He continues to send our way. We are expecting 9 teams this year but as you can likely calculate at the growth rate that we are experiencing here in Haiti 9 teams will only be able to build 9 different buildings. We need more hearts to be directed towards the Lord and what he is doing here in Haiti. 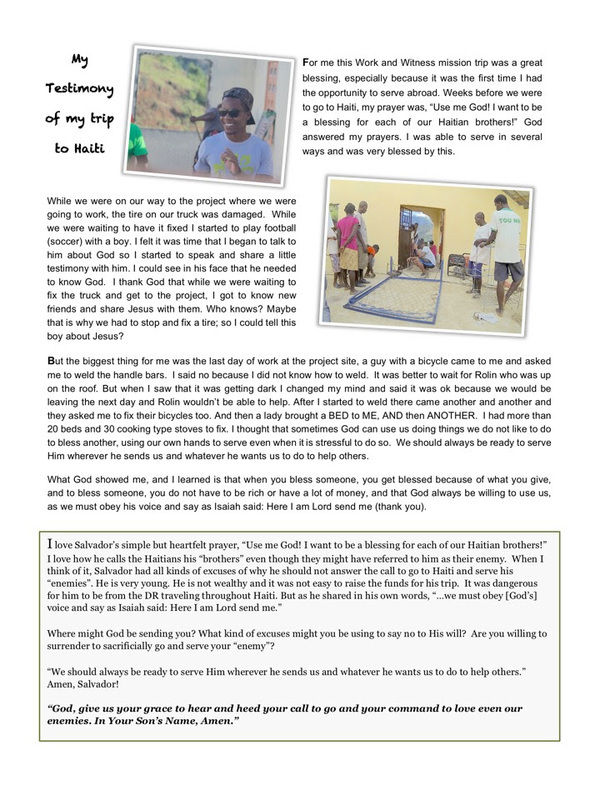 This month’s newsletter tells the special story of a young man named, “Salvador” who decided to let his heart be directed towards his “enemy” and obey God’s call to Haiti. I think you will be blessed by his witness and testimony. Praise God for the beginning of the construction of the new Chapel Factory the first week of December. Tonya has started more advanced language classes. Please pray that God would give added grace as she progresses in the goal of speaking Creole. Pray for our family as we are separated from one another in three different countries. Praise God that the Lord has made a way for us to be together for Christmas this year. Pray for Cory as he works two jobs to try and help with expenses while studying at Olivet Nazarene University. He is walking by faith that the Lord will provide for his tuition and living expenses. He has enough to cover his first semester. Pray that the Lord would bring more teams to Haiti to help support the amazing growth taking place in the country. Pray that some of these teams will come from the various churches and camps visited this past summer while on Deputation. Thank you for praying for Ryan and his final semester at St. Mary’s University in Halifax, NS. He graduates with his Business Degree January 23rd. Please continue to pray for him as he will be making decisions regarding his future. Please join us in asking the Lord to provide the financial means to attend the Mesoamerica Regional Missionary Retreat this May. The flights are the responsibility of the missionaries while the accommodations are covered by the Region. 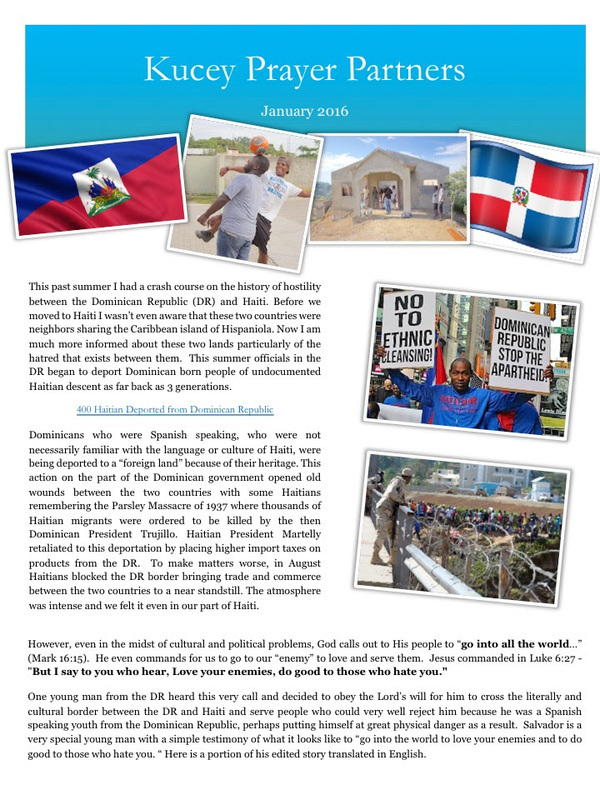 Ask the Lord for stability and safety in Haiti during the coming political elections. Final Election Day is Jan. 17th. There will need to be additional prayer coverage for the announcement of the outcome of the elections approximately 7 days later. Seek the Lord with us to locate effective strategy for the significant growth in the Church of the Nazarene in Haiti and the additional demand for construction of churches. Pray for wisdom and direction in the area of health, fitness and nutrition. Tonya has continued to struggle with various health issues and would covet additional prayer for her physical restoration. Join us in asking the Lord for his guidance and direction for discipling the new followers of Christ through the JESUS Film. Pray for our Work and Witness staff; Colson, Fatil, Asnet, Wilio, Michel as well as the 35 other contracted employees; masons, welders, painters etc. 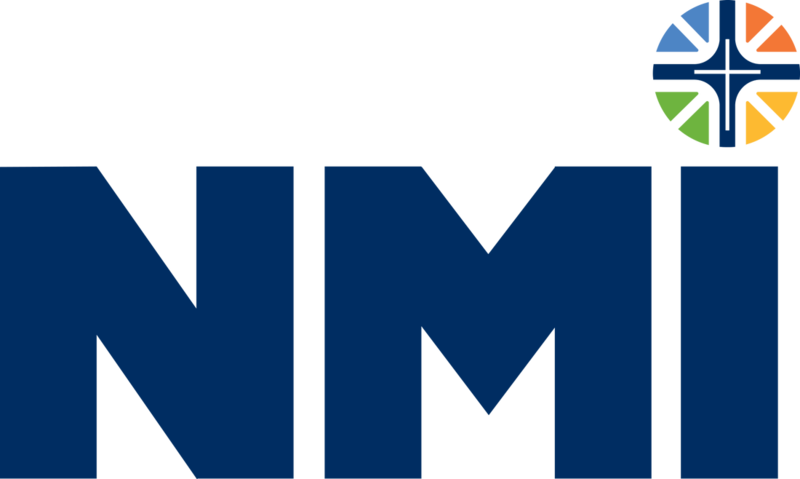 Ask for the Lord for his blessing on the other Nazarene missionaries in Haiti and ministries; NCM, Haiti Water Project, Haiti Hot Lunch Program, the 43 JESUS Film teams and Seminary. Petition the Lord for his protection upon the Kucey family as they live and travel throughout the country; that no weapon forged against them will prosper. Pray for the teams scheduled to come in 2016 and for the Lord to send more teams to Haiti to help with the tremendous needs here.This is a boxed text block. You can use it to draw attention to important content.